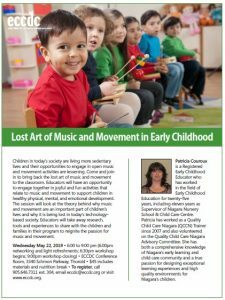 Educators will have an opportunity to engage together in joyful and fun activities that relate to music and movement to support children in healthy physical, mental, and emotional development. The session will look at the theory behind why music and movement are an important part of children’s lives and why it is being lost in today’s technology-based society. Educators will take away research, tools and experiences to share with the children and families in their program to reignite the passion for music and movement.